IT'S BEEN A VERY PLEASANT BANK HOLIDAY WEEKEND IN MANCHESTER, and it feels like the summer has definitely arrived! THE STREETS AHEAD FESTIVAL was a big attraction in the city centre over the long weekend. Many more events are planned, and the climax will be the Great Northern Fiesta on 31 May, when the Great Northern Square, currently taking shape just off Deansgate in front of the old Great Northern Goods Warehouse will be officially opened. 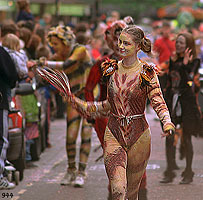 More details on the website at www.streetsahead.org.uk. 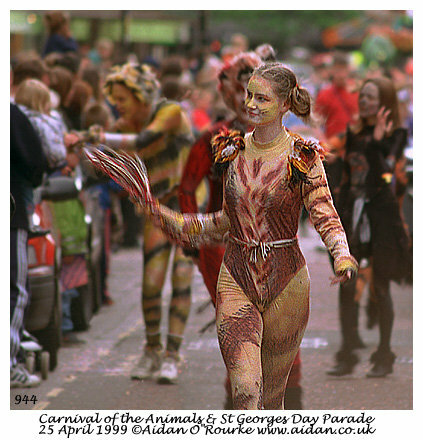 I had a request for more pictures of the Carnival of Animals. Here they are. More on the 940-949 index page. 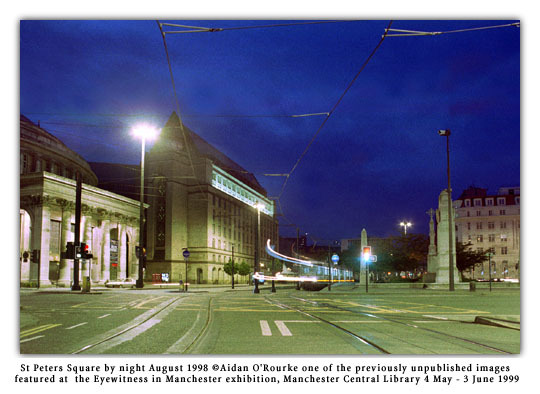 THE EYEWITNESS IN MANCHESTER EXHIBITION opened at the Central Library today. I currently have about 60 pictures on display, and more will be added as the month progresses. This month or next may see a new development in Eyewitness in Manchester, with a move towards "near-realtime" web publishing. With a digital camera and laptop, I hope to take pictures, write reports and upload them straight away. I've delayed buying a digital camera, as I haven't found one which meets my quality requirements at the right price.I'll still continue to use film of course, as it produces better results at high resolution. I've put a full exhibition catalogue online, including a few previously unpublished photos, one of which is at the top of this week's page. Please wait a couple of minutes for the thumbnails to download. I'll also include one or two new images from the exhibition in the body of this newsletter. THE MANCHESTER EVENING NEWS leader today attacked the politically correct lobby who have criticised the "Just William" novels written by Richmal Crompton, who was born in Bury. The critics say that William's schoolboy pranks glorify antisocial behaviour. The editorial also mentions the decision of the public service Union to move International Nursing Day from Florence Nightingale's birthday, next Tuesday, to a new date. The Union reckons Florence Nightingale is too middle class and privileged to be a figurehead for today's multicultural profession, and have chosen Mary Seacole instead. The daughter of an English soldier, and from Jamaica, she did valuable service in the Crimean War, according to Bowdon-based ex-army officer Colin Robbins, who reckons though her work was valuable, she wasn't as influential as Florence Nightingale in promoting the nursing profession. 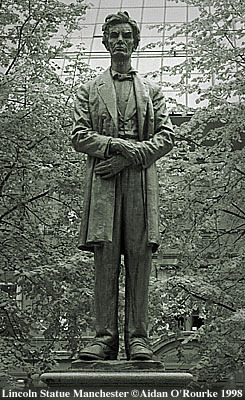 Another example of PC in the heart of Manchester is the inscription on the Abraham Lincoln statue, which quotes a speech by the great 19th century American president, thanking the workers of Lancashire for their solidarity during the cotton famine. Someone in the Town Hall decided to change his words, from "the working men" to "the working people". EYEWITNESS IN MANCHESTER SAYS: Don't rewrite history to suit the perspective of the present. People talk about people or things being "ethnocentric", i.e. the prejudiced viewpoint of one particular people or culture which doensn't take into account other cultures. Well I'd like to propose a new word: "chronocentric" i.e. the prejudiced viewpoint of one particular time or era which doesn't take into account the viewpoint of other times. ON SUNDAY THERE WAS AN IMPORTANT SIKH FESTIVAL - A Sikh temple float, mounted on a lorry, drove up and down Wilmslow Road, playing Indian music. Gurus with orange turbans and long beards were on board, and waved at me when I took a photo (coming later this week). A marquee was set up in Platt Fields and lots of families wearing bright orange converged on the park. I thought the float was great, with its bright colours of orange, yellow and gold - a piece of northern India transplanted right into the heart of England: I can't imagine the local Vicar singing choral evensong on the back of a lorry with miniature steeples on the cab, but who knows? THE HEADMASTER OF ST BEDES SCHOOL, regarded by many as Manchester's top Roman Catholic grammar school, has been making the headlines again. Not so long ago, the redoubtable John Byrne banned his pupils from taking part in Comic Relief fundraising activities because some of the money went to charities in favour of abortion. Now he has threatened his pupils with suspension if they take the day off to go to Barcelona for the Manchester United match on the 26th of May. A picture of Mr Byrne staring through narrow eyes appeared on Saturday's MEN, and even though I'm a grown man, that look still puts the fear of God in me! 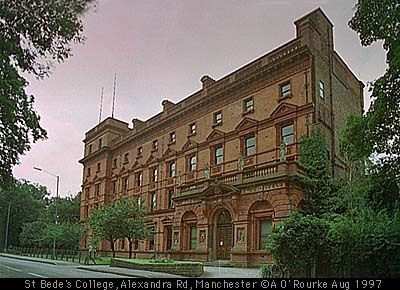 I visited St Bedes as an external student to sit in on German lessons by the highly professional Mr Chadderton, and once met then ex-headmaster Mr Ganley. I'm glad I went to the more liberal Xaverian College. ALEX FERGUSON HAS SIGNED a new three year contract. He'll be paid £32000 a week, making him the highest paid football manager in the UK. WORK BEGAN OFFICIALLY ON THE 2002 STADIUM last Thursday. It will cost £90m and have 48000 seats. Manchester City Football Club should be moving in after the games, though I understand this isn't certain. I was at the 2002 site again on Friday, but there was little activity. I'll be tracking the progress of the structure over the coming months. Here's how the site looked recently. A TWO YEAR OLD CHILD was nearly killed by a train at Farnworth Station. Tyler Chance was at Farnworth Station with his sister Chantel to watch the trains when the trolley he was sitting in rolled across the platform and the front wheels went over the edge. Chantel first jumped onto the track to try and push the trolley back, then saw a train coming. She climbed onto the platform again, and held onto the trolley , preventing it from being dragged along by the train, and saving Tyler's life. He escaped with only minor injuries, requiring only some stitches. Chantel, who has diabetes, is being hailed as a hero. FIRE CREWS WERE ATTACKED by a group of Jewish youths during a celebration to mark the festival of Lag Ba-Omer. The fire brigade had been called out because a large bonfire was becoming a hazard to neighbouring houses, but when the fire crew started to tackle the blaze, youths started throwing bricks, stones and sticks. The fire service have contacted Jewish leaders in connection with the incident. It's most unusual for Jewish people to be involved in an incident like this, but every community has its rowdy elements. MANCHESTER WAS ON ALERT over the weekend after the horrific bombing outrage in London. However, since a 22 year old engineer was arrested and charged in connection with the attacks, it seems the feeling of danger has quickly dissipated. I think that security should be paramount at all times, and I'm all in favour of the extension of that security technique that brought police so quickly to the suspect: security cameras. I also think people should be able to do training in "security alertness", like first aid. Terrorists can strike at any time, and with its mixture of many different communities. Manchester is a prime target for neo-Nazis. Martin Bell received a death threat during the week, but he's refused to go into hiding, and will continue his schedule of public appearances. JUSTICE SCORED AN IMPORTANT VICTORY LAST WEEK with the jailing of the man once called "Mr Big" in Salford . He was sentenced to 14 years in prison for stabbing a man in the groin on Whitworth Street. The man survived, but could easily have lost his life. But Mr Massey's solicitor says his client is innocent, and says he has excellent grounds on which to base this claim. AND YET MORE GOOD NEWS FOR LAW ENFORCERS, and for the rest of us: Three men involved in a five million pound diamond scam were jailed last week. 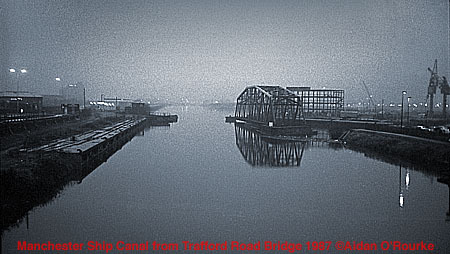 They operated from a council house in Cheetham, Manchester. Amazingly, one member of the gang posed as the brother of the Sultan of Brunei, and managed to persuade a Beverly Hills jeweller to come to Britain with expensive jewellery, which they then stole. ROCHDALE POLICE have gone to Dubai, United Arab Emirates to find out about the mysterious death of diver Robert Glazzard, who disappeared with a New Zealand man off the deck of a ship. The bodies of the two men were found later, but the cause of death was never satisfactorily established. POLICE ROAD CHECKS have been set up on roads around the city centre and in the suburbs this week. Instinctively I reached for my Saudi Arabian identity card, and panicked when I couldn't find it. Then I realised I was in Manchester, not Dammam, and breathed a sigh of relief! Once you've been an expat, the experience never leaves you! Anyhow, the checks are being carried out by Greater Manchester Police to gather information on vehicle movements. It's all part of preliminary research to do with the possible introduction of road tolls. The last road toll in Manchester was the one on Upper Brook St, where drivers had to pay sixpence to pass through Victoria Park. The toll was abolished in 1952. KOSOVO REFUGEES will be coming to Stockport and Oldham. In Stockport they'll be accommodated in a disused hospital, and in Oldham in vacant houses. 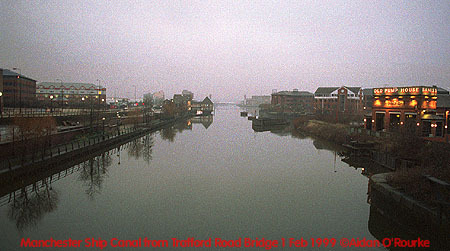 Here are two pictures of the Stockport viaduct. THERE'S BEEN ANOTHER ATTACK OF AIR RAGE this time on a flight from Orlando Florida to Manchester. GMR radio reports the plane was about 50 miles north of Bangor Maine, today, when the pilot decided to turn round and land there after the man, from Milton Keynes, started a fracas, punched and broke the interior window, and threatened to break the outer window, saying everyone would be sucked out and would die. He's currently being held by police in Bangor. "RECLAIM THE STREETS" is the motto of a pressure group whose aim is to do just that, freeing the city of the motor car and giving back the streets to the people (i.e., those on foot). On Friday, they decided to follow their principles to the letter and organised a street blockade in and around Manchester University. 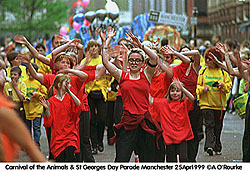 A large group of them occupied Brunswick Street, off Oxford Road opposite the Manchester University John Owen Building, and demanded the street be pedestrianised. Another group of protesters brought traffic on the Mancunian Way to a halt. Some of them waved "A for Anarchy" flags and climbed up onto the overhead gantry. Confrontations took place between the protesters and the police. I wasn't there, so I can't give a description. However, I'm sure the protesters will have succeeded in one thing: antagonising the very people whose opinions they rely on if their policy is ever to succeed. Here's the underside of the Mancunian Way at Brook Street. A MYSTERY GRAFFITI ARTIST has been making his mark on the walls of Tib Street, much to the annoyance of traders there. His indecipherable scrawl, which some think may be a religious symbol, costs thousands to remove. I won't give the mystery scrawler any encouragement by picturing his work. TODAY'S EVENING NEWS carries the interesting story of IT expert David Ashby, from Winsford, Cheshire, and how he met his wife to be, Patti McClure through a chatroom. He'll be moving to Patti's home city of Dallas, Texas after they marry next April, but he will continue his job working for a Cheshire company as a web designer, transferring his work via the Internet. Let's hope he looks at Eyewitness in Manchester and Manchester Online when he starts to feel homesick! AND EYEWITNESS IN MANCHESTER MAY BE visiting Washington DC in July of this year. I'm interested in hearing from local expats living in that area, who I hope to feature. I'll also be taking pictures of the city and surrounding area, and hope to upload them to "Eyewitness in Washington" in near-realtime. Please let me know if you're around at that time. CONCERTS AND EVENTS INCLUDED: Michael Ball at the Apollo, "Rebecca" at the Oldham Coliseum. The British Star Trek Convention took place at the Piccadilly Hotel. We saw "Martin Guerre" at the Palace - a fantastically professional performance by the cast, full of passion from beginning to end, but in my opinion, a disappointing score and storyline. The audience didn't seem to agree with my verdict and gave the performance rapturous applause. Also, Bruce Springsteen appeared at the MEN Arena. A reader e-mailed me with the following report: "I went last night and it was fantastic. It was good to see him get back to his original band, and you could sense the camaraderie and togetherness between them - it was like Springsteen is back to his roots. The crowd roared as he made his way on stage, and the atmosphere was electric - a definite spark between Bruce and the Crowd. It was one of the most enjoyable concerts I have ever been to." IT'S THE LOCAL ELECTIONS this Thursday, and if last year was anything to go by, most people will be staying in and watching the telly. In 1998 I seem to remember that only 10% of voters went to the polling booths to vote for local councillors. It's hardly an overwhelming mandate of support for the likes of Councillors Richard Leese and Pat Karney, but of those who voted, the overwhelming majority voted for Labour. This year the Council has conducted a campaign to get more people to vote, particularly among the black community. If people here had lived in some of the countries I've visited or worked in, they'd make sure they exercise their precious democratic right. As for the probably results, there's no doubt that Labour will continue to dominate Manchester Town Hall. In Trafford, currently held by Labour there's a chance that the Liberal Democrats may take over, or even the Conservatives. Stockport will probably continue as a hung council. "TYPICAL BRITISH WEATHER - Whenever it's a bank holiday, it rains, rains and rains. Ah well, what do you expect?" But yesterday's bank holiday wasn't washed out, in fact it was one of the most glorious days we've seen this year. In Manchester, people sat outside pubs sipping beer or watched the Streets Ahead festival. Others visited the many tourist attractions around Greater Manchester which do a roaring trade on a bank holiday, especially a sunny one. We headed into Cheshire and visited Alderley Edge, Macclesfield, and Little Moreton Hall. Pictures coming later this week. Today it was back to work for most people and the weather, though cloudy was cool and pleasant. Rain is forecast for later in the week. 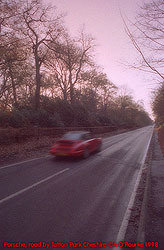 Here's a photo taken in Cheshire earlier this year on a favourite stretch of road... and by the way, that's not my car!